My buddy Pete recommended this book to me. I am glad he did. 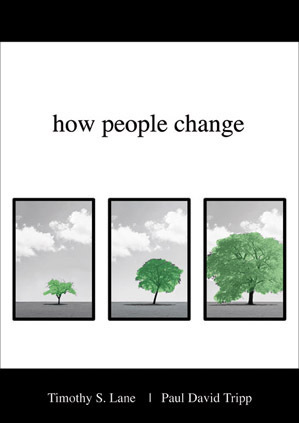 People and change has got to be one of the best selling genres of books. It seems though that most books are the self-help books giving 5 or 7 or 9 ways to help become a better leader, husband, friend, businessman or Christian. But, this book was different in that it didn't leave the responsibility for change to me, but showed how people do and can change by their understanding of Christ, the Holy Spirit and the process itself. T he book uses four word pictures, Heat, Thorns, Cross and Fruit (click on picture to see the process better) to help walk people through the process of life change. The Heat are life's trials and pain and suffering and temptations that inevitably touches every life. The Thorns are the person's ungodly response to the situation. It includes behavior, the heart driving the behavior and the consequences that result. The Cross focuses on the presence of God in the midst of difficult situations to enable right perspective, unlimited potential and unbridled power to change for good and not bad (note: not necessarily change the situation, but change your attitude and the way your process the situation). And lastly, the Fruit, the person's godly response to the situation resulting from God's power at work in the heart to bring about grace-influenced change and the harvest of good consquences that come from it. There were many great things I took from this book, ideas and concepts that were profound. And yet, it is pretty obvious that often the most profound ideas are the most simple. The one that stuck with me the most is that in every situation, every hard time, in every struggle and temptation, that my potential is Christ. What a great line. My potential in any and every situation is Christ. Christ in me is my hope of glory. And as Christ in his love and power and joy and peace and kindness and trust works in and through me, my hope for victory is secure. My confidence in overcoming are rooted in His works done and His work to be done. I really appreciated the idea that change does come through heat. The book of James says that trials are to be considered joy because they test our faith and develop perseverance so that we can become mature and perfect. Trials make us dependent on God. Trials make us become the people we have always wanted to be. So, I knew all this, but what I didn't really put two and two together was that trials are the mechanism for producing fruit to the glory of God. Just like nature uses heat to produce fruit in trees, God uses heat to lead us towards fruit that glorifies Him. John 15:8 says, By this is my Father glorified, that you bear much fruit and so prove to be my disciples. I often wonder how to bear fruit for God so I can glorify him when the answer is right there is my every day battles. Fruit comes through Christ to Christ for Christ. One of the other things that I really appreciated was how the heart is the center of all Fruit producing. Tedd Tripp wrote the book "Shepherding the Child's Heart" and his brother co-wrote this book. Both deal extensively with the heart and how out of the heart everything flows. The Shepherding book deals mostly with child rearing and this books deals mostly with adult rearing. But, it really is the same biblical, simple, brilliant concept that change comes not at the behavior level, but at the heart level. And the only way that the Heart will produce the change unto fruit is if the redemption of Christ has changed the whole person, starting at the roots, the heart. So, saying all that, it is worth reading for sure. But, I would say this, that the book is thick and full of application and if I were to read it again, (I will read it again) I will do it in the context of community. And I would encourage you if you want a good book to read and discuss and be honest and truthful about life and struggles in community, this is the book. It is deep theology but it is also deeply applicationally (I made that word up) oriented. I wished during the read that I had someone who knew me to help me answer some of these questions. So there it is... Enjoy the book and change. Thanks Pete. Next month: The Reason For God by Tim Keller. Any takers on that journey with me? I'm glad you enjoyed it. I just finished going through it with a number of college students; now our community group is starting into it. Great, great book. Thanks, Steve. This book sounds refreshing. I really am tiring of being told that if I just would get my act together I could glorify God more. That sounds so counter-truth and counter-gospel to me. Yes, there are things we each definitely need to do to grow in our relationship with our Lord, but He takes care of our sanctification. I am in the process of beginning to see the glory in trials. Not that I respond correctly to them all (or even most...), but I'm beginning to see that the end result is good. Thanks for this blog entry!! Our church is looking for curriculum that incorporates the traditional discipleship model of 2:7 with the heart insights of "How People Change." Do you think the Nav's series is open to mixing in insights from the Tripp book? Do they harmonize well?